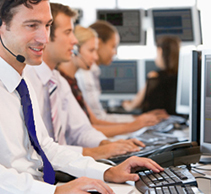 Today’s contact centre is much more than a simple call centre. Agents interact with customers through phone calls, voice messages, email, text, web chat and social media. Any company running a contact centre knows how important it is for the success of the business. It is a key point of contact for your customers so ensuring a personal, efficient and fast service is imperative to creating a positive perception. Tiecom is an accredited distributer of the Zeacom ZCC Unified Contact Centre solution, which gives full visibility on how your business is communicating with customers. It is extremely cost-effective, as it runs on one server, providing one application, and using only one administrative interface. ZCC was developed to provide Unified Communications to organisations with up to 2500 desktops, in conjunction with contact centres employing between 10 and 250 agents. If you want to enhance service levels and improve staff productivity, look no further. The ZCC solution lets you see agent activity levels and monitor the delivery of customer service through all types of contact. Reduced call abandonment rates and improved customer satisfaction through smart features such as automatically directing callers to a preferred agent or the last agent they spoke with, Interactive Voice Response (IVR) messaging to give out information to the caller, skills-based or value-based routing to pass specific calls straight to the right agent, etc. Standard and custom reporting formats available. Custom integration and CRM interface development.